As earlier announced that the “Unsend a message” feature will be coming to Facebook for Android and iOS Soon without any particular time frame of rollout. 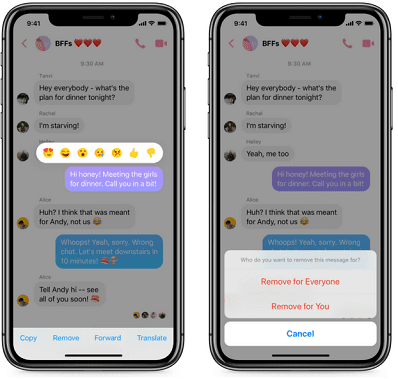 But today, Facebook Messenger announced the unsend message option will be rolling out in batches according to a report from TechCrunch. The first countries to get the feature are Bolivia, Colombia, Lithuania, and Poland. If you live in these cities, update your app and the Unsend message option should be visible. Just like what we have on the popular instant messenger WhatsApp, Facebook “Unsend message” gives you the option to delete any message that you mistakenly sent, you’ll have to tap and hold on the message and choose the “Remove for Everyone” option. You can delete text, group chats, photos, videos, links and more — within 10 minutes of sending. You can still delete any message on just your side of the conversation, but only messages you sent can be removed from their recipients. But Facebook will hold on to that message for a little while just to be sure that it can review it if it’s reported for harassment. Facebook believe that people who delete messages sent by mistake do it in less than a minute, hence the 10 minute time window. Other countries should be expecting the roll out of the Unsend message feature in the coming weeks.